Personal protective equipment (PPE) is protective clothing, helmets, goggles, or other garments or equipment designed to protect the wearer's body from injury or infection. The hazards addressed by protective equipment include physical, electrical, heat, chemicals, biohazards, and airborne particulate matter. Protective equipment may be worn for job-related occupational safety and health purposes, as well as for sports and other recreational activities. "Protective clothing" is applied to traditional categories of clothing, and "protective gear" applies to items such as pads, guards, shields, or masks, and others. This is an incorrect use of personal protective equipment, because the gap between the glove and the lab coat exposes the wrist to hazardous materials. Many migrant workers need training in PPE for Heat Related Illnesses prevention (HRI). Based on study results, the research identified some potential gaps in heat safety education. While some farm workers reported receiving limited training on pesticide safety, incoming groups of farmer workers could also receive video and in-person training on HRI prevention. These educational programs for farm workers are most effective then they are based on health behavior theories, use adult learning principles and employ train-the-trainer approaches. Workers using personal protective equipment while painting poles. 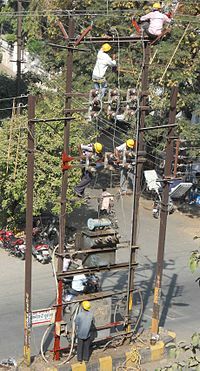 While basic head protection is present, no engineering fall protection systems appear to be in place. NHS medics practise using PPE to treat Ebola patients. Members of FEMA wear PPE to protect against radioactive hazards. Worker wearing a face shield, a helmet, Tyvek coveralls, gloves, and earplugs while decontaminating a containment boom. Rescue worker wearing a half-mask respirator. Riot officer dressed in armor to protect against impacts. National Hockey League goaltender wearing the required PPE to play. Trawl fishermen wearing brightly colored personal flotation devices to protect against drowning. ^ Verbeek, Jos H; Ijaz, Sharea; Mischke, Christina; Ruotsalainen, Jani H; Mäkelä, Erja; Neuvonen, Kaisa; Edmond, Michael B; Sauni, Riitta; Kilinc Balci, F Selcen; Mihalache, Raluca C (19 April 2016). "Personal protective equipment for preventing highly infectious diseases due to exposure to contaminated body fluids in healthcare staff". Cochrane Database of Systematic Reviews. 4: CD011621. doi:10.1002/14651858.cd011621.pub2. PMID 27093058. 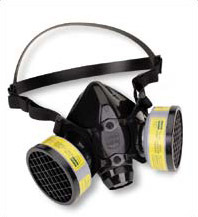 ^ a b c d Respirators Archived 2012-08-30 at the Wayback Machine. National Institute for Occupational Safety and Health. ^ CDC - NIOSH - Respirator Fact Sheet Archived 2017-09-28 at the Wayback Machine. The National Personal Protective Technology Laboratory. ^ a b c d e CDC - Skin Exposures and Effects - NIOSH Workplace Safety and Health Topic Archived 2012-08-06 at the Wayback Machine. The National Institute for Occupational Safety and Health. ^ Luque, John S. (15 October 2018). ""I Think the Temperature was 110 Degrees! ": Work Safety Discussions Among Hispanic Farmworkers". Journal of Agromedicine. 24: 15–25. doi:10.1080/1059924x.2018.1536572. ^ a b CDC - Eye Safety - NIOSH Workplace Safety and Health Topic Archived 2017-07-07 at the Wayback Machine. The National Institute for Occupational Safety and Health. ^ a b c d e f g CDC - Eye Safety - Eye Safety for Emergency Response and Disaster Recovery Archived 2017-09-02 at the Wayback Machine. The National Institute for Occupational Safety and Health. ^ a b c CDC - Noise and Hearing Loss Prevention - Facts and Statistics - NIOSH Workplace Safety and Health Topic Archived 2016-07-03 at the Wayback Machine. The National Institute for Occuaptional Safety and Health. ^ Occupational noise exposure - 1910.95 Archived 2015-04-02 at the Wayback Machine. The Occupational Safety and Health Administration. ^ Criteria for a Recommended Standard: Occupational Noise Exposure Archived 2017-02-02 at the Wayback Machine. DHHS (NIOSH) Publication No. 98-126. ^ CDC - NIOSH Science Blog - Brain Injury in the NFL Archived 2012-12-20 at Wikiwix. The National Institute for Occupational Safety and Health. ^ Lehman, EJ; Hein, MJ; Baron, SL; Gersic, CM (2012). "Neurodegenerative causes of death among retired National Football League players". Neurology. 79 (19): 1970–4. doi:10.1212/WNL.0b013e31826daf50. PMC 4098841. PMID 22955124. Archived from the original on 17 September 2012. Retrieved 20 September 2012. ^ a b "Larry Flynt's Hustler Video Cited by Cal/OSHA over Condoms, Safety, Says AHF". businesswire.com. 2011-03-31. Archived from the original on 6 August 2016. Retrieved 6 May 2018. ^ "Council Directive 89/686/EEC of 21 December 1989 on the approximation of the laws of the Member States relating to personal protective equipment". europa.eu. 30 December 1989. Retrieved 6 May 2018.